The tobacco giant continued its inexorable climb higher. Find out why. Tobacco company Altria (NYSE:MO) has defied naysayers for decades, finding ways to survive threats from litigation, regulatory restrictions, and long-term declines in smoking rates along with the usual competitive pressures from Reynolds American (NYSE:RAI) and other cigarette manufacturers. After a strong 2014 that saw the stock climb 34%, Altria investors might have expected a pullback, but 2015 has still been kind to shareholders with a strong return this year as well. Let's take a closer look at how Altria has kept its momentum this year and what it means for the future. 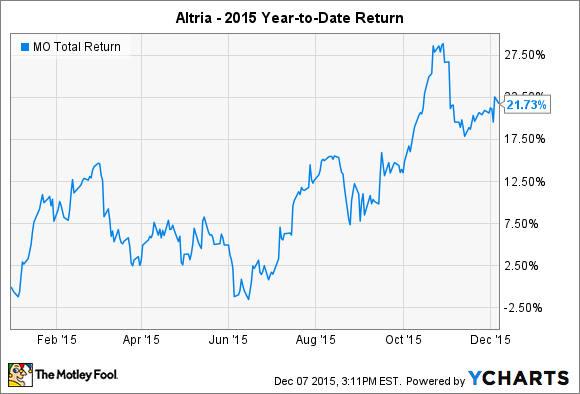 What has happened to Altria in 2015? Altria entered 2015 with investors feeling some anxiety. The impending merger of Reynolds American and fellow tobacco rival Lorillard created concerns about Altria's ability to compete effectively with a larger company in the No. 2 position, especially given the historical strength of Lorillard's Newport brand and its command of the menthol-cigarette market. In addition, pricing increases had proven insufficient to keep up with volume declines in much of 2014, calling into question the sustainability of Altria's growth. Yet those concerns proved unwarranted from the standpoint of Altria's company fundamentals. In the first quarter, revenue jumped 5% as the company managed to boost both prices and volumes. Altria's second-quarter results continued that unusual pattern, with a 3% rise in volume pushing sales up almost 6%. The tobacco giant also did well in the third quarter, with a nearly 5% rise in revenue coming despite flat shipment volumes from year-ago levels. A couple of factors whipsawed Altria's stock during the year. Many investors see the stock as being a proxy for a fixed-income security, with its modest growth potential and high dividend resembling the payouts of a bond. Therefore, when investors became worried that interest rates might rise sharply, Altria shares also felt the pressure. During the second half of the year, though, fears of a big rate hike disappeared, and that led to better performance. The other major factor came from Anheuser-Busch (NYSE:BUD) and its offer to buy SABMiller. Altria owns a sizable stake in SABMiller, and after some back-and-forth negotiating, Anheuser-Busch came back with an offer that would allow Altria to take a stake in the beer maker and avoid a big capital gains tax bill in a merger. Altria has a host of opportunities ahead of it. Even though the Reynolds and Lorillard merger has gone through, Altria remains the top cigarette company in the nation by market share, and its strong Marlboro brand hasn't lost any of its reputation among smokers. The MarkTen initiative has built up electronic cigarettes and other alternative products as a potential growth provider for Altria, and the smokeless tobacco and wine businesses under Altria's corporate umbrella round out an interestingly diversified portfolio. What will come from the beer business remains to be seen, but SABMiller could become even more valuable as part of the larger Anheuser-Busch InBev, making it an even more important part of the Altria portfolio. With dividends still rising and fundamental strength in its financials, it's not ridiculous to think that Altria could continue to see gains in 2016. Investors will want to keep a close eye on interest rates to see if the stock reacts to a rate increase. Yet with the company delivering surprising growth in 2015, Altria could well have some more surprises up its sleeve to impress investors next year and beyond.